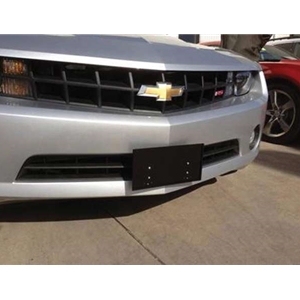 Fifth Generation Camaro owners do not want to attach anything to the front bumper of their beautiful front bumper. Not only is it an eye sore but leaves holes. Now you can be within state compliances with this new quick release front license plate frame. No holes to drill. Removes in seconds. Black powder coated for long wear. For shows or washing all you do is quickly remove the frame, then when done clip it back on.